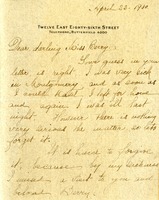 Hope regrets that her illness prevented her from travelling to Berry. 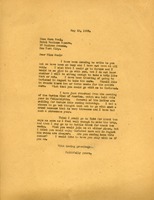 On the subject of a memorial for Everit Macy, she feels that it is something for his children to do, and if not them, she is sure that his sister Kate Macy Ladd will. She is willing to speak to Ladd, but has not been invited to visit. Hope advises Berry that Henry Sloane has complained that his gifts to Berry have gone unacknowledged. Berry regrets that Hope is ill and asks her to visit. 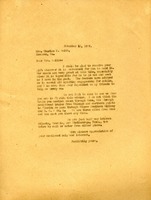 A letter enclosing partial payment to Johns Hopkins Hospital gynecologist Howard A. Kelly. 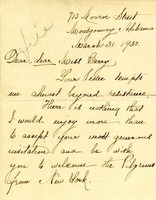 Berry invites Kellogg to speak at Berry. 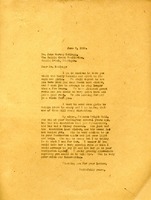 She informs Kellogg that her niece Frances Wright Ball is recuperating from the operation he recommended and asks him to give her a special rate so that she can spend time at the Battle Creek Sanitarium. Drs. Wachter and Groedel report has been sent to Dr. Harbin's address. They hope Berry is well and hope to see her at Sanatorium Groedel next year. 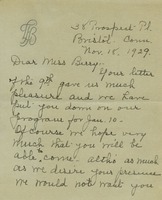 Berry writes to her niece Frances Ball, who is in the Johns Hopkins Hospital. Berry discusses Ball's health, saying she wishes for her to have the best care and that she is anxious to do anything she can for her. Berry sends news of Christmas, the baby's presents and development, and visitors to Oak Hill for the holiday. She suggests that Ball order something to eat from Miss Gilmer at The Little Inn as it will be better than the hospital food. Wingo describes the treatment she will receive from Dr. Goldthwait, who has many devoted patients, at his Devereux Mansion sanitarium. Wingo conveys the desire of the Boys' School faculty to view motion pictures at the Girls' School because the projector there is better. 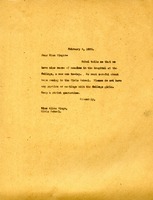 Wingo feels that the measles quarantine prohibits the visit. 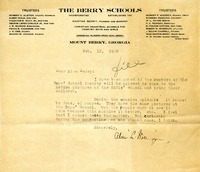 Martha Berry instructs Alice Wingo to keep a strict quarantine between the Girls School and the College because several cases of measles have been reported at the College. 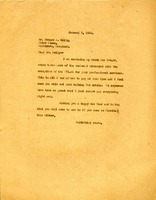 Miss Berry writes to Mrs. Smith about her failing health and inability to go out and work as she has in the past. 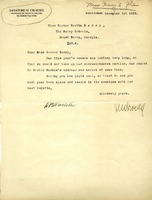 She also asks Mrs. Smith to come visit her and gives her some information on reaching the school by train or automobile. 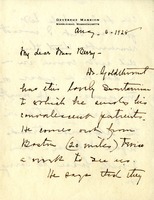 George H. Smiley encloses a contribution collected after a play given at Lake Minnewaska Mountain Houses and sends good wishes for Martha Berry's recovery.